Radioactive iodine found by Dartmouth researchers in the local New Hampshire environment is a direct consequence of a nuclear reactor's explosion and meltdown half a world away, says Joshua Landis, a research associate in the Department of Earth Science. The failure of the Fukushima Daiichi nuclear power facility, following the March 11, 2011, earthquake and tsunami, was the largest nuclear disaster since 1986 at Chernobyl. "We live on a really small planet and this demonstrates that what happens in Japan has the potential to affect us." Landis and a team drawn from Dartmouth's Department of Earth Science and Department of Geography recently published a paper in the Proceedings of the National Academy of Sciences addressing such concerns. "Though regrettable, the Japanese catastrophe did provide a unique opportunity to examine the transport and accumulation of radioactive iodine in the environment," Landis says. "We took up this study mostly as concerned scientists in our own right, wondering how much of this contaminant is really coming down, and where the iodine is moving in the landscape." The paper reports that testing in New Hampshire's Mink Brook watershed during March through May 2011 showed the amount of radioactive iodine deposition in the soil was minimal, with calculations revealing the total amount to be on the order of 6,000 atoms per square meter. Landis comments that "at these levels, it is unlikely that this is going to cause measurable health consequences." However, sampling of Mink Brook stream sediments showed a doubling of iodine concentrations relative to what was found in soils. But even in these concentrations, stream and river transport are expected to result in significant dilution. 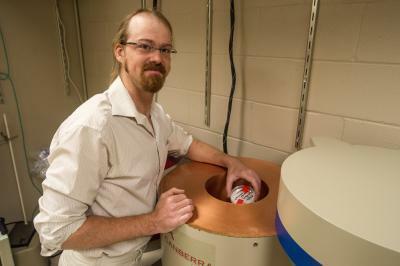 Dartmouth research associate Joshua Landis prepares to introduce a radioactive sample into a gamma-ray spectrometer. The radioisotope iodine-131, a significant constituent of the fallout, is a by-product of nuclear fission, highly radioactive, acutely toxic and presents a health risk upon its release to the environment. It does have a relatively short half-life, which is both a blessing and a curse, Landis notes. "It releases a lot of radioactivity, which makes it dangerous, but it's gone very quickly so there is no long term exposure risk," he says. Its high radioactivity, however, makes it very detectable by the gamma-ray spectroscopy instruments used by the Dartmouth team in its analyses. This is not the case with another isotope, iodine-129, released concurrently with iodine-131. It is not as radioactive, which makes it much harder to measure, but it is much longer lasting and, as it concentrates in certain areas over time, it may become more hazardous. "Due to its long half-life and continued release from ongoing nuclear energy production, [iodine-129] is perpetually accumulating in the environment and poses a growing radiological risk," the authors point out. The production rate of these two isotopes in a nuclear reactor occurs at a fixed ratio of 3 parts iodine-131 to one part iodine-129. The two substances travel together, so the presence of the easily detectable isotope also signals the presence of the longer-lived one. "If you have a recent event like Fukushima, you are going to have both present. The iodine-131 is going to decay away pretty quickly over the course of weeks, but the iodine-129 is there forever, essentially," Landis says. However, he explains, "Once the iodine-131 decays, you lose your ability to track the migration of either isotope." Thus, the group's research turned toward the development of an innovative alternative approach to measuring and tracking the iodine. What became an important off-shoot of their work was the methodology of using the benign radioisotope, beryllium-7, as the tracking indicator. It's an easily detected natural radionuclide, and is routinely used by the Dartmouth researchers in their environmental analyses. The Dartmouth researchers have shown that beryllium-7 follows the same transport paths as the iodine isotopes. By ascertaining the ratio of association of the beryllium to the iodine, tracing the beryllium-7 as it moves through the environment then allowed the researchers to track the parallel transport of iodine, and to demonstrate the accumulation of iodine fallout in stream sediments.